How do I test a TWAIN device? You may get problems when using your application with some scanners and wonder whether it is the issue with your application or it is the device issue. 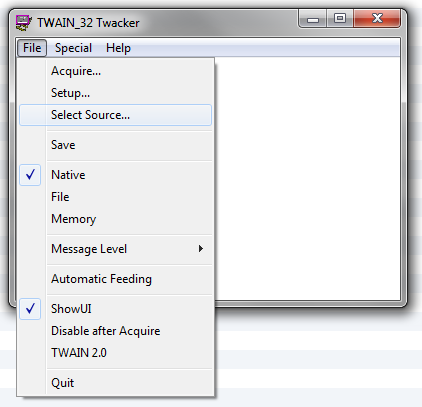 If you are using a TWAIN library and your application is supposed to work with all TWAIN compatible devices, you can use Twacker, which is a TWAIN application developed by The TWAIN Working Group. It allows you to exercise features of a TWAIN driver and to see whether the driver of your device is working fine or not. 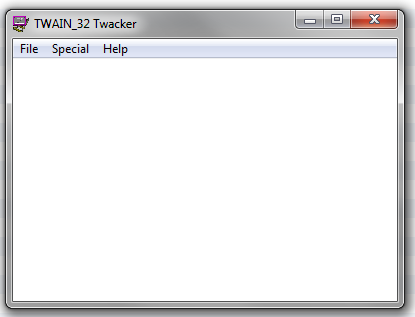 32-bit Twacker works with 32-bit TWAIN drivers, while 64-bit Twacker works with 64-bit TWAIN drivers. After the installation, you can follow the steps below to test your scanners. Launch Twack. Go to Windows Start menu and type Twack. Connect to your scanner. Click menu File-> Select Source and you will see all the available sources available on your machine. Test your scanner.Under File menu, check ShowUI to show the user interface of the device. With UI hidden, you can use the Automatic Feeding setting to test ADF scanning. Click Acquire to initiate scanning and see how your device works. TroubleshootIf you fail to acquire images from your scanner using Twacker, you can adjust the Message Level to see if you can get more information to pinpoint the cause of the issue. Under Special menu, you can also check the TWAIN State transition info. You can also test your scanner using the online demo of Dynamic Web TWAIN, which is a browser-based TWAIN SDK. You only need to install an ActiveX/Plug-in for your browser (Internet Explorer/Chrome/Firefox, Safari) and have a quick check for your scanner online. In some scenarios, such as Visitor Monitoring module for a government department or Patient Tracking module for a hospital, we may need to take a snap of human faces, patient charts, user IDs and so on and then upload them to a central server. How do we implement this for a web application? How to interact with webcams connected to a computer in browsers? Flash – The web application requests permission to use the camera and the user will be presented with a dialog indicating the site wishes to use the camera. After the user accepts, the application will be able to grab images from the camera. 3-rd party browser plugin – Internet Explorer can interact with an imaging peripheral through an ActiveX control. Firefox and Chrome can do the same through a plugin of Netscape Plugin Application Programming Interface (NPAPI). In this article, we are going to take a look at the 3rd option – Dynamic Webcam SDK. Unlike in the first 2 options where a developer needs to deal with camera initialization, an image capturing, editing encoding and uploading separately, everything is encapsulated in Dynamic Webcam SDK. Dynamic Webcam SDK is a browser plugin which enables users to acquire images from a webcam, edit and then upload/save them to a database, web server or local disk. Also, it can capture a live video stream into a container and grab a snapshot to be exported to a file/binary. The plugin works with all webcams that are compatible with Windows Image Acquisition (WIA) and USB video device class (UVC). Two editions are provided for different browsers: ActiveX Edition for IE and Plugin Edition for other browsers on Windows OS. Firstly, copy DynamicWebcam.cab to the web server. There are 32-bit and 64-bit CAB files. Choose the proper one according to the needs. The trial and full versions of Dynamic Webcam use different class-ids. DynamicWebcam.cab can be found in the installation folder of Dynamic Webcam SDK. <object classid="clsid:A65BC1E1-B2CE-4251-A0CB-721AC7E02B52" id="DynamicWebcam1" width="143" height="156"
Plug-in edition can be used in Gecko-based browsers including Firefox, Chrome, Safari & Opera on PC. Please copy DynamicWebcam.msi to the web server. A lot of businesses and organizations have a bunch of existing digital documents and images that require to be handled. These digital materials might be shared documents for different departments in the company, collected images from the customers, and more. In this article, I’ll share with you on how to take advantage of a third-party image acquisition & processing component Dynamic Web TWAIN to handle these existing images. The following samples are based on the assumption that you’ve installed Dynamsoft’s Dynamic Web TWAIN on your development machine (30-Day Free Trial Download). You can use the LoadImage method to load images from your local disk or a shared folder. Supported image format includes BMP, JPEG, PNG, TIFF (both single and multi-page) and PDF (both single and multi-page). LoadImage is a perfect method for image loading if you know the exact path and name of the images. If you want to provide a flexible way for your customers to load their local images, you can set IfShowFileDialog to true to show the browser dialog box. After loading the images to your web application, you can further process them, for instance, scanning new documents and uploading all of them to your library.